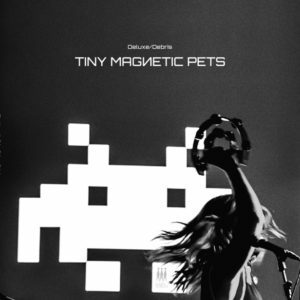 Releasing their first album in 2010, it’s been a steady path of progression for TINY MAGNETIC PETS. 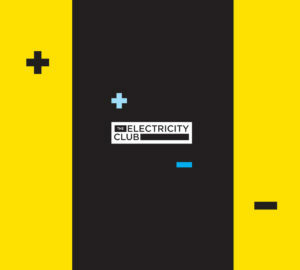 It was helped along by an endorsement from The Blitz Club’s legendary DJ Rusty Egan, where the Numan-eqsue ‘Control Me’ and the dreampop of ‘We Shine’ were regular staples of his Electronic Family Tree show on Artefaktor Radio. 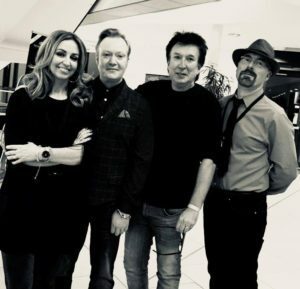 But when The Electricity Club introduced TINY MAGNETIC PETS to Andy McCluskey at the 2015 Electri_City_Conference in Düsseldorf, little did anyone realise what it would lead to, least of all the charming Irish trio themselves. 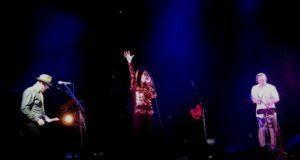 The end result was an invitation to open for OMD on the UK leg of ‘The Punishment Of Luxury’ tour. However, the sojourn actually began at home in Dublin; “we had a massive crowd and following there” remembered singer Paula Gilmer, “the reaction was incredible”. But to get to this point, months of logistical planning and rehearsal had been required. The band’s gear was kept streamlined as they were using nothing more than a 4 door hatchback with a flux capacitor on their UK jaunt. Also, the band had just 30 minutes each night to make their impression. “When you do a tour like this” drummer Eugene Somers says, “you have to be aware of your time slot and that you’re on / you’re off! With this tour, it was going to be electronics all the way. The kit is basically an SPD-SX, you have to compromise”. It looks like a tea tray, but cranked up through OMD’s sound system, it is mighty. On the keyboard front, synthesist Sean Quinn has had to strip it all down to a Roland XP10 workstation and a Novation which he enthuses as being “a fantastic workhorse of a synth, it’s quick and easy and has Moog sounds, ARPs, string machines”. This set-up makes things easier at soundchecks which can be tedious and frustrating affairs. At the Cambridge Corn Exchange, things go reasonably well but Eugene is not happy about a slapback on his bass drum. After a quick discussion with sound engineer Chicky Reeves, a solution is offered and accepted. Luckily as the band are using an electronic kit, the adjustment is much more straightforward. 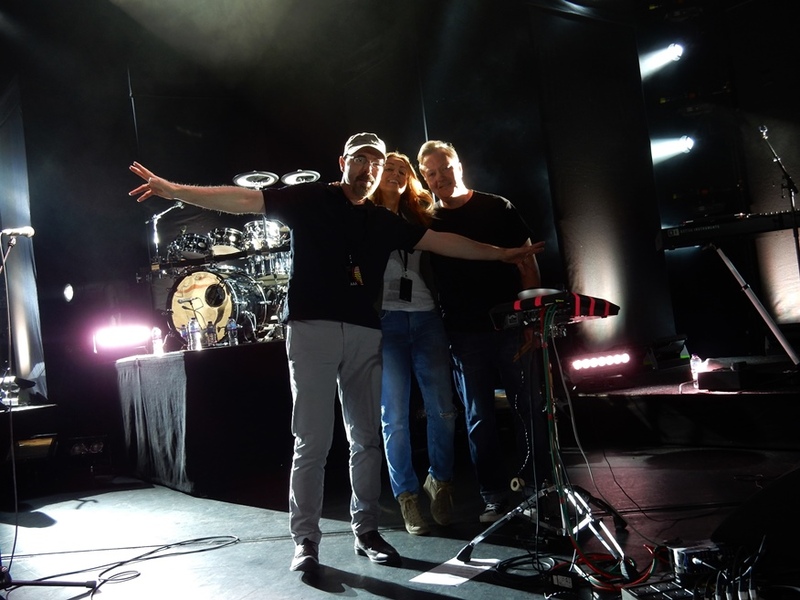 Eugene could be referred to as a colours drummer, much like OMD sticksman Stuart Kershaw and the pair bond well during the tour. A bit of a reggae fan, Eugene is heavily influenced by Stewart Copeland and his subtle style adds power when appropriate. He is a drummer that actually enhances an electronic band, unlike the numbskull antics of Christian Eigner, the polarising drumhead for DEPECHE MODE. For Paula, things are less complicated with her not needing to set-up or clear-up equipment; “Mine’s easiest” she laughs, “just the tambourine”. But she works closely with the band’s manager Una Fagan on the business side and as the pretty face of the band, she is the first to go and meet the public after TMP’s and OMD’s performances. 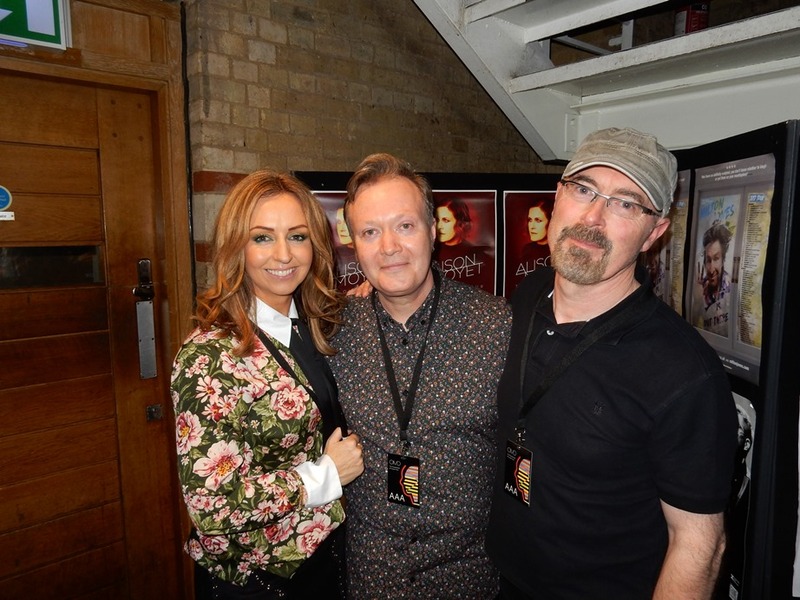 While the soundcheck is in progress, Una is liaising with OMD’s tour manager about catering arrangements while also completing PRS forms. A vital source of income for live acts, some bands don’t even bother registering and it’s a testament to TINY MAGNETIC PETS’ professionalism that they have taken this aspect seriously. At dinner, the band sit with the crew and OMD’s Martin Cooper. Sean gets distracted by an amusing conversation that Eugene and the crew are having about embarrassing albums in their collections. Earlier, Sean and Eugene had a fierce but friendly discussion in the dressing room about whether being a fan of YES and MUSE was mutually exclusive! Paula doesn’t get involved, saving her voice and disappearing into her own space in preparation for the show after having her salad. TINY MAGNETIC PETS are treated well by OMD and their crew. However, this is not always been the case with support acts on tours with other major acts. One artist wasn’t spoken to by the headliner, while the crew blanked them on the tour bus. They were even asked to reduce the number of items they had for sale on the merchandise stand. Luckily, there’s no such issues for TINY MAGNETIC PETS; Una chats with the merchandise personnel about positioning their items to the right of the stand next to a lobby area where Paula, Sean and Eugene can meet and greet new fans. “It couldn’t be better. We’re really at ease and totally enjoying it” says Paula while Eugene is very happy that “They’re treating us like kings and queens”. There is enthusiasm after TINY MAGNETIC PETS’ set at Cambridge. It has gone well and Paula’s Irish charm has won over people. “We’ve been selling a lot of CDs and vinyl” says Sean, “that’s been a surprise” while Paula adds “People have said that they’re not too into support acts but are loving us which is so lovely to hear” – even those who have chosen not to make a purchase come over to offer their positive feedback to the band. Eugene enjoys the aftershow banter too, noting: “It’s so good to meet the fans and in turn, give it back to us. That is a key factor. There are people finding us for the first time on the day and it’s lovely compliments we’re getting”. Between sets, a chance meeting with Paul Humphreys on the stairs backstage results in a conversation about TMP’s set. As a fan of KRAFTWERK and LA DÜSSELDORF, the OMD synth man is quite taken with ‘Semaphore’, especially its extended instrumental section which echoes ‘Europe Endless’ and ‘Rheinita’. If SAINT ETIENNE collaborated with KRAFTWERK, TINY MAGNETIC PETS would probably be that composite end result. But at 10 minutes long, ‘Semaphore’ takes up a third of the allotted set time but “it was always going in and it was unanimous” according to Eugene; “Apart from anything else” enthuses Sean, “it’s just a lot of fun to play live, there has to be a certain edge when you’re playing live”. ‘Semaphore’ certainly seems to be the track making the biggest impression; “People always come up to us and ask ‘what was that last song?’” says Sean, “that’s fascinating”. Social media has picked up for TINY MAGNETIC PETS so prompt reciprocal engagement is important to build support. Twitter acts as the most straightforward live platform, while Facebook takes a bit more effort and is usually looked at after the show at the hotel. “The comments have been great on Twitter and Facebook” confirms Sean. Throughout the tour, the all-important likes and follows come in with ease, but it’s the actual comments and feedback which make gauging reaction much easier. TINY MAGNETIC PETS make efforts to take selfies and provide a pictorial travelogue to connect with the audience and potential media outlets. This is one aspect they have good hang of and something that other acts in the same position as them can learn from. The band usually watch OMD perform although this can be dependent on how far Una’s car has had to be parked from the venue. A keen dancer, Paula likes to see as much of OMD performance as possible, almost as a way of unwinding; “We have watched OMD every night, it’s an amazing show. ‘The Punishment Of Luxury’ and ‘What Have We Done’ are sounding fantastic live”. Meanwhile, Sean adds: “It’s wonderful hearing these records in a live setting. I love the new album”. 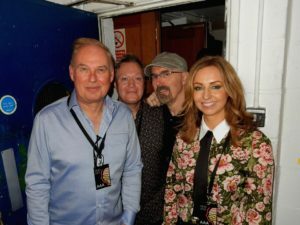 It was interesting to observe that even off duty, Paula is recognised by well-wishers who come up to her during the show to compliment her on the band’s performance and her fine voice. But she is an experienced and charismatic performer who connects well with people; “When we’re performing” she confirmed, “we like to build it up so we started with the slow, chilled back stuff and build up to the climax. We’re pushing a lot of the new stuff and it’s going down a treat”. Their new album ‘Deluxe/Debris’ builds on the momentum of ‘The NATO Alphabet’ EP from 2016 and fittingly features ex-KRAFTWERK percussionst Wolfgang Flür on two songs ‘Radio On’ and ‘Never Alone’ with the latter, an enticing highlight of the Cambridge set. The album has been released by Happy Robots Records, a small independent label run by Adam Cresswell. He’d enjoyed the first album and got chatting with the band online over a shared ability to quote ‘Spinal Tap’. 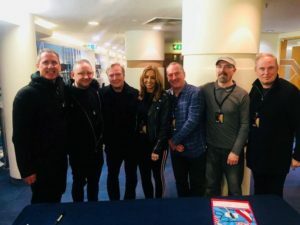 “They were friendly, professional and seemed to be actual music fans, which is essential in my opinion” he remembered, “so at their next London gig, I stumbled over to the lads at the bar, and asked ‘who is putting out your next album?’. And it just fell into place. 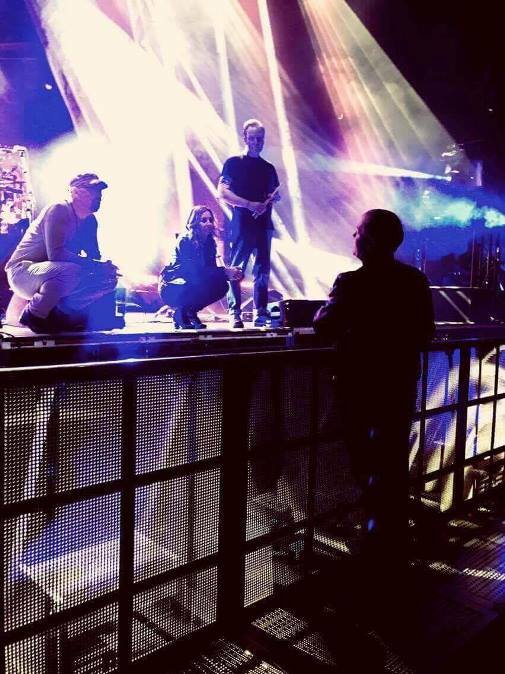 I had no idea Wolfgang was going to be on the album or that they would get the OMD tour, but clearly somebody up there likes me”. But what was been selling more, vinyl or CD? : “The plan was always to put the album out on vinyl” said the label boss, “Although expensive, it was worth it for aesthetic reasons alone. On LP it looks, sounds and feels like a classic synth pop record. It was fan pressure that talked me into pressing a CD, and on tour the CD has been selling more and that is totally understandable – you can’t stick an LP in your back pocket. But no-one anticipated the numbers we would sell and that we would be repressing before we’d hit the halfway point. The LP is still selling nicely online too”. As the tour progresses, TINY MAGNETIC PETS continue to impress. 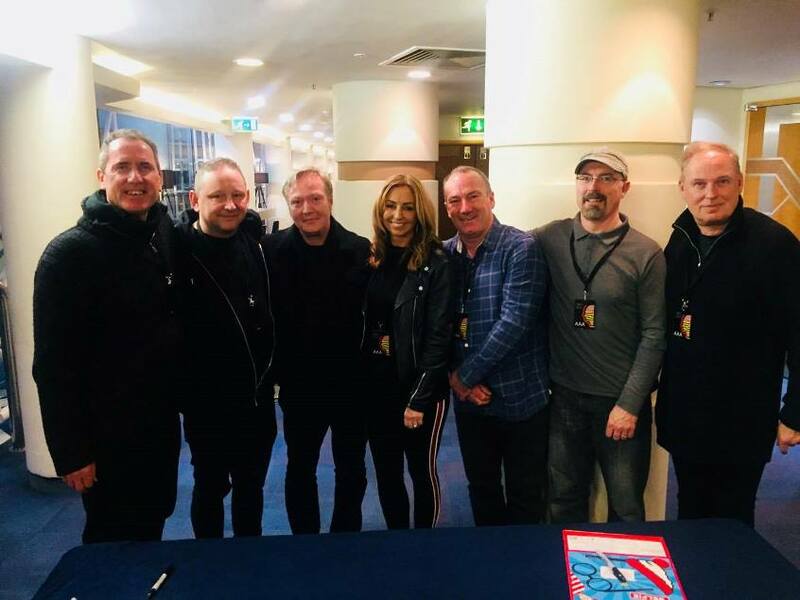 At Southampton Guild Hall, Lorraine Brown of My Music Passion observed: “it was really special to see TMP perform on a big stage to an audience of thousands. 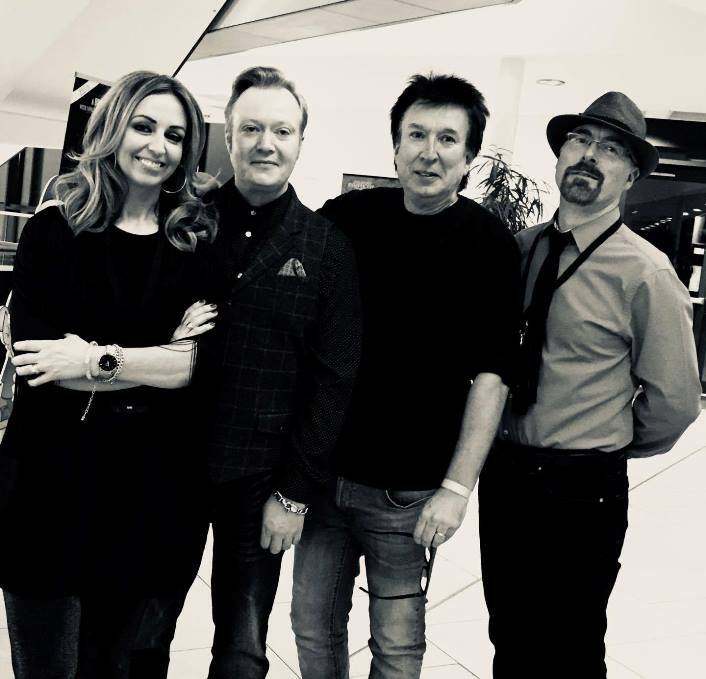 Their set went down incredibly well and, given that I was sat on the balcony, I could see the audience were well and truly engaged and seeing so many of the audience members congratulate them on the performance afterwards was a joy”. Meanwhile in London, their longest standing champion Rusty Egan expressed his delight: “I was very pleased to see TINY MAGNETIC PETS who proved to me and the OMD audience at the Roundhouse that their simple melodic synthpop songs with a great vocalist are winning new fans”; he was also very pleased “they also thanked me for my small part in their success”. ‘Nuntius’ star Mr Normall also reported that: “TINY MAGNETIC PETS managed to fill the floor at the Roundhouse from the start of their set and that doesn’t happen too often with support bands. 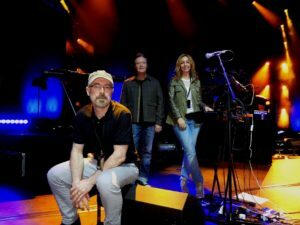 I believe all the audience were not there just to see Paula on stage but the band has gained a new following with their second album ‘Deluxe/Debris’ and the gig at the Roundhouse proved that the increased popularity is rightfully earned”. In Guildford, Chris Payne who played in GARY NUMAN’s band comes backstage to give his best wishes to TINY MAGNETIC PETS. 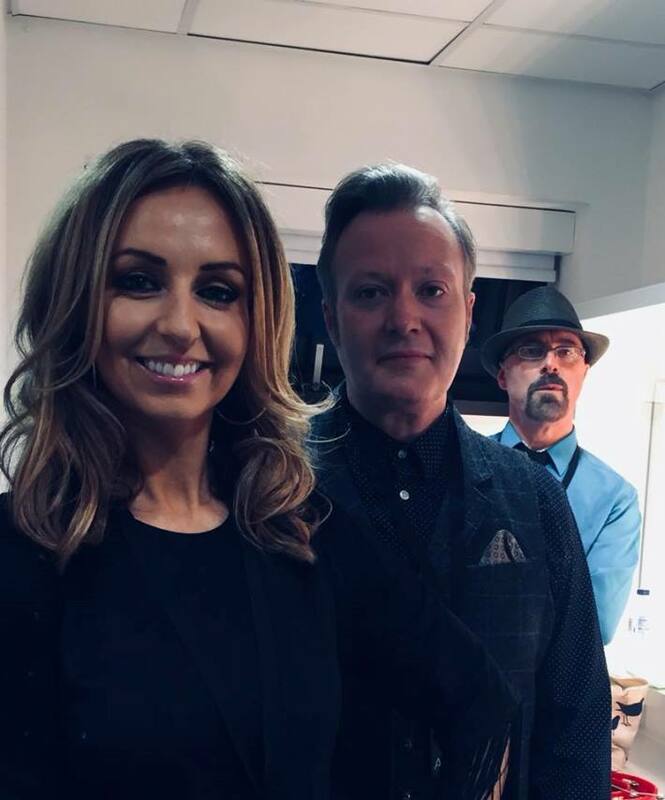 It is also the first time he has seen Andy McCluskey and Paul Humphreys since OMD opened for Numan on ‘The Touring Principle’ in 1979. With the reunion came hearty recollections of on tour practical jokes, like when Chris sabotaged Winston The Tape Recorder on the final night at Hammersmith Odeon and how Andy still owes him a fiver! 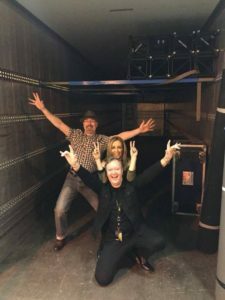 As the tour reaches its end via Birmingham and Gateshead, TINY MAGNETIC PETS don’t want to go home and even have a jokey photo taken of them trying to stowaway in the back of OMD’s truck. Undoubtedly, the last four weeks have been a success. What happens next is up to them, but whatever TINY MAGNETIC PETS do now, there are undoubtedly more people interested than there were before. And it’s to OMD’s credit that they give new electronic acts an opportunity to play on a big stage with them. TINY MAGNETIC PETS follow a fine tradition of acts like VILLA NAH, MIRRORS, METROLAND and VILE ELECTRODES who were all featured on The Electricity Club prior to being invited to open for OMD.